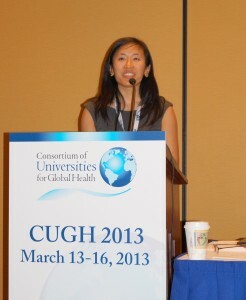 At CUGH’s Annual Meeting last week in Washington, DC educators and students from over 60 countries met to discuss the global health landscape. Perhaps one of the most powerful and emotional sessions was one that captured power of reflection in global health education. 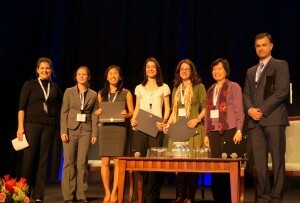 The session and the 2013 CUGH Student/Trainee Reflection Essay Contest was made possible through support by Child Family Health International (CFHI), in collaboration with the Consortium of Universities for Global Health (CUGH) and University of Pittsburgh Center for Global Health. Eight trainees from undergraduate to post-graduate levels read their personal reflections on global health education experiences that affected them. The reflections ran a gamut of topics, one having witnessed a young mother hemorrhage to death in Sub-Saharan Africa, another reflected on the phenomenon of Westerners posing for staged pictures with local children and villagers in resource-poor communities. Ginny McCarthy, the Assistant Director of Loyola’s Center for Community and Global Health, closed the session with a description of how reflection can be integrated into educational programming. CFHI espoused it’s belief and model that reflection is necessary not only on individual levels, but also engaged in by organizations and institutions to remain in touch with reality in a field laden with ideals. CFHI program experiences provide unique opportunities for personal and professional development, when this is wedded to reflection we are able to foster conscious transformation.